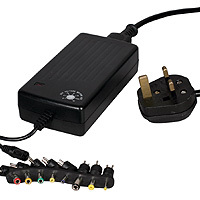 Most of the basic components used here are commonly available from Electronics stores such as Maplin Electronics and Farnell. Scalextric tracks should be of the basic "Sport" analogue old-style 1:32 ratio variety. 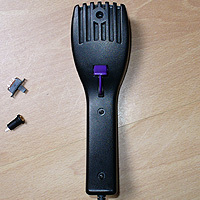 The handsets use a 3.5mm stereo plug connector. Digital tracks will not work with this guide. The track I have adapted for is the Starsky and Hutch set which features crossovers and magnetised cars. There are many others that can be found in specialist toy stores, direct from Scalextric and from around the web. Contact Scalextric's customer support if unsure. As a general rule, if you can connect the power unit pictured below, and each car has it's own dedicated track, you should be fine. 1x Scalextric C8217 Sport Powerbase Track (old-style with four round ports at the front and a blue toggle switch on the top as pictured above). 1x AC to DC regulated switched-mode power supply (up to 15 volts, e.g. Maplin "L11BQ"). 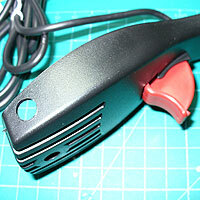 1x Scalextric Sport Hand Controller (code "C8229" or "C8230"). 1x 3.5mm socket (e.g. Farnell "126-7396"). 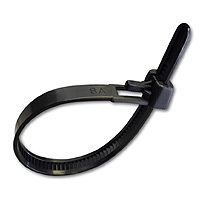 1x 1A 20mm x 5mm slow-blow fuse with in-line holder. Soldering iron; thin solder; soldering flux; wire (e.g. 16 strand 0.2mm); Shrink Wrap. Cordless drill with 3.5mm and 7.5 mm drill bits and 20 mm drill bit or circular stepping drill bit; Knife or wire strippers; small screwdriver set; Needle nose pliers; (optional) Multimeter; Small hot glue gun. Remove the powerbase screws, and carefully open up. 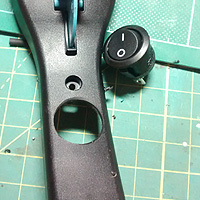 Remove the blue toggle switch plastic cover. Block the hole with a vented cover (e.g. a bit of plastic with some small holes drilled into it). Hot glue into place. Ensure that the switch on the PCB is set to the ~16V/~16V position. Doing this means that there is no option to use a single power supply to drive two or more tracks. This reduces user confusion, gives better speed regulation for both cars and reduces the amps running through the powerbase, prolonging its life. Remove the three screws then open up your handset. Read on for technical details or skip straight to section three below. "Inside a standard 45ohm Scalextric Sport hand throttle: The inset diagram shows how the throttle is wired. When the throttle is in the closed position (as shown in the photo) the wiper (black wire) short circuits to the 'brake' contact (red wire)." - Taken from PicProjects. For our purposes we will simplify this circuit by disabling the "brake" feature. 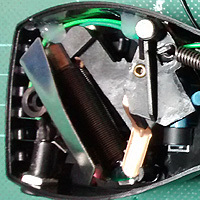 Remove the red "brake" wire and mounting. Ensure that the wiper does not touch any metal when resting. Fit the switch socket (A). Keep all wires away from the metal plate using hot glue to secure. Splice one of the trailing socket wires into the green wire and the other into the black wire as close to point B as you can. Fit an on/off switch at point (C) ideally fitting a 1amp slow-blow fuse at that point (not pictured bit fitted between the left-most ON/OFF switch blade and the green wiring). N.B.The on/off switch is used to turn off power to the car at any time. Useful for starting or stopping a race. 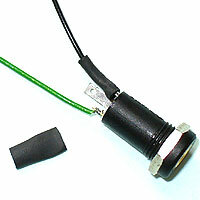 The 1amp slow-blow fuse helps to protect the AC to DC diodes within the Sport Power Base and any connecting switches. 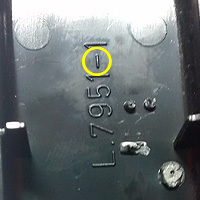 Carefully mark a pilot hole (I use a soldering iron) that will leave enough room to fit your switch socket and ON/OFF switch. Drill a 7.5mm hole for the switch socket if using the Proline style. Drill a 20 cm hole using a stepped drill bit for the ON/OFF switch (if using the round-type as pictured). Tidy any rough parts from your drilling. 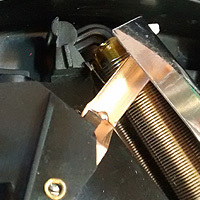 Take two lengths of wire, long enough to comfortably span the route from point A (the switch socket) to point B (around the bottom of the spring). See the larger image at Step 4 above. Solder these to switch socket as pictured. Heat-shrink these if you wish to add strength and to insulate. Remove the nut. Push the socket through the casing. It may help to use a flat surface and a small pair of pliers to push it fully through. Fasten in place with the metal nut. To secure this further you may wish to hot-glue the nut into position. Keep your new wiring away from the metal heat-sink by wrapping it around the edges of the controller and hot gluing it into place. Avoid any snagging that may happen when the trigger is pulled. Snip the hand-set wiring around the bottom of the spring to free up the green, red and black wires. 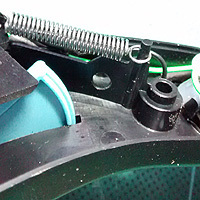 Remove the red wire: Unscrew the metal housing underneath the wiper blade (pull the trigger to access). Cut the red-wire at the bottom of the controller and discard. Hot-glue the exposed remains of the red-wire at the bottom of the handset. 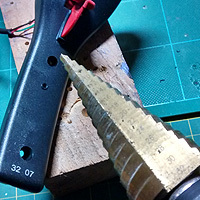 Pull the trigger to ensure that the blade is not touching any metal when in the resting postiion. 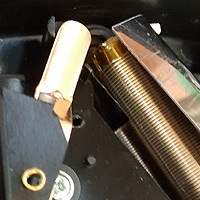 If it does, carefully push the metal edge slightly inwards (not the coil). Ensure it does not touch anything either side. Solder the bottom-most green wire to the bottom blade of the ON/OFF switch. 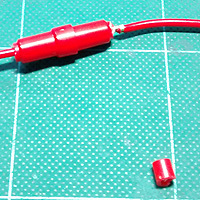 Shorten the fuse holder if needed, using hot-glue over any exposed metal. 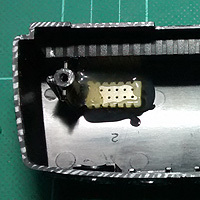 Carefully slot the fuse holder on the right-side of the hand-set. Drill a 3.5mm hole under the spring (pictured left) to enable the bottom red wire to be pulled out of the way. Tuck the wire around the controller as pictured. Solder one end to top blade of the ON/OFF switch and the other to the two green wires. Black wires: Use a short length of black wire to link all three black wires back together. Use shrink-wrap. 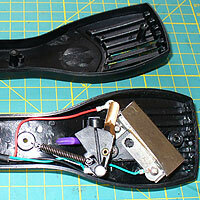 Check all, hot-glue any loose wiring or anything liable to snag on anything, then reassemble. At this stage you should be ready to test on your Scalextric track. Try with a switch connected, and try the on/off switch. Speed limiter: Reduce the top speed of a car by reducing the voltage down from 15 volts to a lower setting for each car with its individual power supply. Drone/Turbo mode: Use a re-usable cable-tidy to partially or fully pull the trigger in on one or both hand-sets. This enables two possibilities: 1. Set a drone car to drive around the track at a speed that prevents it from flying off the corners. 2. Turbo mode means that your car will cruise around the track by itself until you press your switch to give a burst of momentary turbo! ON/OFF switch: Use this to help start and stop races for switch users and to prevent motor burnout in accident situations.